Website & facebook info | The citizens’ organization has a Website and facebook page. “approachable, responsive” leadership | This Lancaster Online article (“Tale of three cities: Harrisburg, Lancaster, York mayors outline their visions”) is worth reading – if you can get around the paywall). Each of the mayors “pleaded for more cooperation from their surrounding municipalities and their county governments — more partnership in planning, and especially more willingness to share the cost of social services.” Lancaster’s mayor, Danene Sorace pointed to her city’s Website lancasterblockbyblock.com and (said) progress will be tracked there so residents can see if its goals are being met.” This mayor is really reaching out to its citizens with meetings in numerous venues. 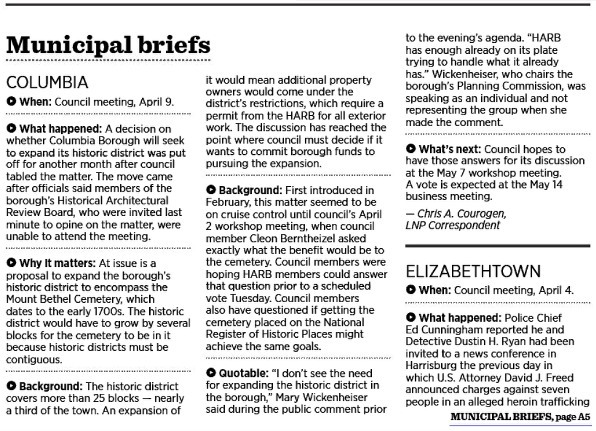 Columbia’s Tuesday night meeting is in today’s Municipal Briefs – LNP – Always Lancaster. H.A.R.B. Why? | Why does Columbia have a Historic Architectural Reviews Board? Because it’s in the ordinances. Park design, as have many fields, has become myopic. The designers design to impress other park designers without thought of what regular people want. The design for the river park is a joke and a great disservice to the community. It also totally ignores the possibility of increased water levels and flooding in the future, and it duplicates services that currently exist with the Crossings building.